Whether it is a wedding, anniversary or corporate event, once you have chosen your venue the next factor you need to consider is the furniture. But not all of us are born with an interior design streak, so if you have been tasked with choosing the furniture for your chosen venue you might need a few tops. Getting the right furniture that compliments your venue will all add to creating the right ambience, whether this is through the colour scheme, the style or the look of your event. We have put together a list of tips to help you get the right furniture in your chosen venue. It is a modern space or a more traditional building? You will want to make sure that your furniture is in keeping with the venue, so for ultra-modern rooms consider chairs and tables with sleek lines, made from metal or plastic or even utilising LED lights. Our ghost and ice chairs look amazing in contemporary dwellings, whereas if you are renting older establishments then our Chiavari upholstered chairs come in a range of colours. Urban settings suit our new gunmetal range and our Eames and Tolix chairs add style and atmosphere. Your furniture should be an extension of the venue itself, so don’t choose modern-day furniture for a fine dining event, or elegant chairs for a retro venue. Once you have chosen the venue consider the amount of space you have to play around with and what the event will entail. Do you need a dancing area set aside? Will there be a stage at the front of the room? You don’t want to pack out your venue with chairs and tables and not give your guests room to manoeuvre. Plan out a design where guests are not too crowded and if you need extra seating areas, such as sofas or bar stools, make sure you have left enough room so that your invitees have different areas to relax in. 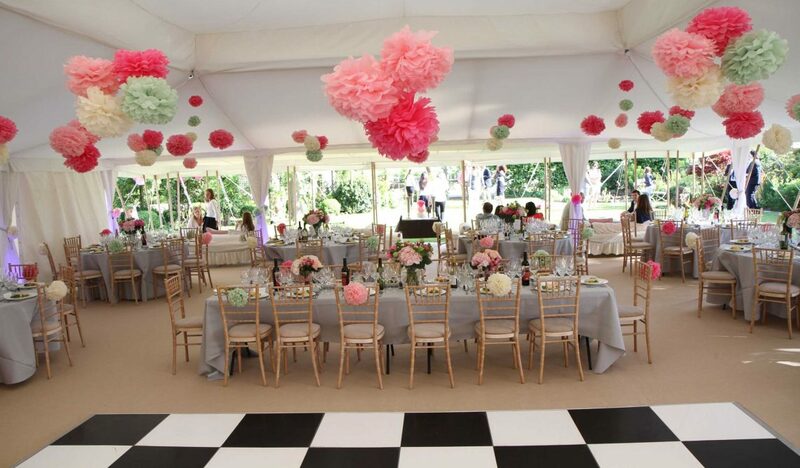 By carefully planning the best use of space you can make sure you have utilised the venue to its greatest potential. Whether your event is taking place indoors or outside it is important to match up the furniture to compliment the surroundings. Outdoor events can use a range of different styles, but take into consideration the type of event and choose your furniture accordingly. So for example, a rural event set in a barn would suit our cross back chairs and we hold a range of tables, including trestle, beer and modular that go really well in an outdoors setting. We also supply a range of children’s tables made from durable plastic that are weatherproof and ideal for little ones. If you are holding your event indoors then for fine dining experiences consider our huge range of table linens that can be used on any of our tables and add a real air of luxury. For modern setting we supply poseur tables made from glass that look stunning as your guests arrive, and don’t forget our huge range of LED furniture that always adds a real wow factor to any venue. Remember, when choosing the furniture for your event, take a good look at the style of the venue and the type of event you are holding and take it from there.